BERLIN, Germany -- Germany upped pressure on Ukraine to release former Prime Minister Yulia Tymoshenko. 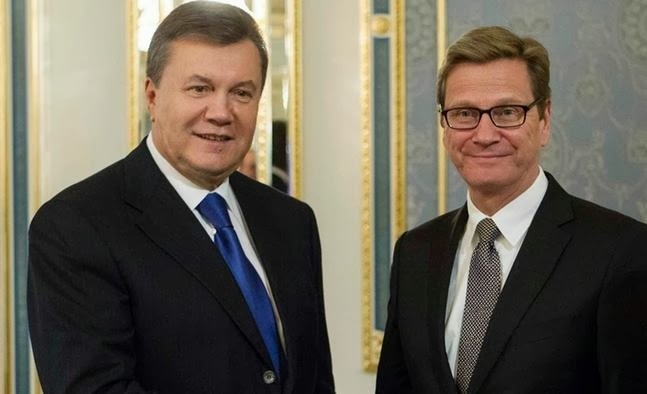 Yanukovych (L) with Westerwelle in Kiev. While in Kiev, German Foreign Minister Guido Westerwelle repeated an offer to medically treat jailed opposition leader in Berlin. It was likely the outgoing German foreign minister's last official trip to Kiev. Guido Westerwelle started a two-day visit to the Ukrainian capital Thursday for a conference, but the visit was also about the fate of former Ukrainian Prime Minister Yulia Tymoshenko. Ahead of the trip, there was speculation Westerwelle travel with Tymoshenko back to Berlin. Germany has for months offered to take Tymoshenko, who has suffered from a back problem during her imprisonment, to be treated by German doctors in Berlin. Recent statements by German President Joachim Gauck also fueled speculation about Tymoshenko's possible imminent exit from Ukraine. "I believe, we will see some actions that will satisfy us," Gauck said on Wednesday after talks with his Ukrainian counterpart, Viktor Yanukovych, along the sidelines of a meeting in Krakow, Poland. A spokesperson told DW that Gauck has pushed for a solution for Tymoshenko's case, which for the German president represents a "measure of the credibility and sincerity on the efforts of the Yanukovych administration for the development of democracy and a constitutional state." "Germany has made its offer." Westerwelle said, adding that difficult negotiations are ongoing. The foreign minister's statement increases pressure on Yanukovych. Germany's chief diplomat in Kiev already held discussions on the issue this past June. Ukrainian Foreign Minister Leonid Kozhara had said that a Tymoshenko solution would only possible within the Ukrainian legal framework. He previously had repeated that laws precluded medical treatment abroad for prisoners. In this sense, the poker game over the imprisoned former opposition leader has entered into the next round. Tymoshenko's release has become one of the European Union's central conditions in signing an association treaty with Ukraine. The already brokered agreement has been on ice for about two years due to Tymoshenko's imprisonment. Both sides are aiming to sign the agreement at a summit on the EU "Eastern Partnership" initiative at the end of November in Vilnius, Lithuania. But the word from both Brussels and Berlin is that certain terms sought by the EU, including a humanitarian solution for Tymoshenko, must first be fulfilled. Tymoshenko has been sitting behind bars for more than two years. The 52-year-old was sentenced to seven years in prison in a trial widely criticized by Western countries and the international community. She had been accused of overstepping her powers as prime minister in signing gas treaties with Russia in 2009. Tymoshenko has denied the accusations and called the case one of politically motivated justice. Due to Tymoshenko's ongoing back issues, she is being held at a hospital in Kharkov, in eastern Ukraine. German doctors travel regularly from Berlin to treat her there. In the meantime, public pressure on the Ukrainian president is increasing, apparently with each day. At the beginning of October, former Polish President Aleksander Kwasniewski and former European Parliament President Pat Cox of Ireland - who regularly travel for the European Parliament to Ukraine in order to observe cases of "selective justice" there - wrote a letter requesting a pardon for Tymoshenko. The opposition in the Ukrainian parliament has also gathered signatures for Tymoshenko's pardon, and even former Ukrainian President Leonid Kutschma has spoken out in favor of allowing Tymoshenko to travel to Germany. Yanukovych has, however, appeared to be unimpressed by the domestic and foreign pressure. He has repeatedly said for the time being, all charges against Tymoshenko must be fully adjudicated - she is still being prosecuted under various accusations, including tax evasion. Anna Herman, a parliamentarian of the governing Party of Regions and a confidante to Yanukovych, said Yanukovych won't make a decision under pressure and won't pardon Tymoshenko before the November summit. Kwasniewski and Cox will release a much-anticipated report on their observations in the coming weeks. The two will present the results of their mission in the Tymoshenko case to the European Commission and European Parliament this coming Tuesday. The European Union will base its decision on whether to sign the association agreement on this report. The law must be amended to allow prisoners to seek a treatment outside Ukraine in case those prisoners have funds to do so and Parliament petitions such release to the President. Yulia Tymoshenko should leave to Germany as soon as possible, preferably with one of the German's officials escorting her. The condition for her travel must be that, she will stay in Germany for as long as her half-term jail expires. That would mean another year and a half. President Yanukovych, with all my respect to him for his strength in the efforts to bring Ukraine and Russia closer to EU, must do what is right for Ukraine and its people. The President of Ukraine must set a side personal fillings about Yulia Tymoshenko and move on. If Tymoshenko stays in Germany until her jail term mounts to 50% of her original 7 years term, she will be no threat for him in 2015 presidential elections.